Here is a blog from a year ago that did not make it over from our blog hosting switch over. I thought I’d repost! I originally wrote this blog because I have seen a number of “newer” point of sale companies posting these fantastic statistics on how much data, customer records, reporting etc they can handle. I’ve always taken it for granted that you “over program” based on customer needs. We originally wrote SP-1 using a C-Tree database that supports incredibly fast indexing of data files. This allows us to be incredibly flexible when designing software. The main programming is done in C++, .NET and Assembly for some of the routines. To satisfy our curiosity I thought I’d check the statistics on what we can handle in our database! 999,999,999 Total number of customers. Yes just shy of one billion. 10 email addresses per customer. Or 9 billion or 1.42 email addresses for each person on the planet. 10 phone numbers per customer. Or 9 billion or just shy of one per every phone number possible in the U.S.
4 addresses per customer. Or 12.8 addresses per person in the U.S. – 314 million at last count. 9,999 Total tickets per day – That is 6.94 tickets a minute for 24 hours. Or 13.88 tickets a minute in a 12 hour day. Menu items? I think we have you covered. . .
9,999 Total Menu Groups. Coffee, Pizza, Ice Cream, Smoothie, Sandwich etc. 999 Active specialty or signature items per menu group. Examples would be Latte, Mocha, Meat lovers, Veggie etc. 999 Active modifiers per menu group. Examples are Vanilla, pepperoni, wheat, hot, cold, extra shot etc. 99,999,999,999,999 Inventory or retail items. (That’s Trillion with a ‘T’ and probably the only thing bigger than our national debt). Yes – 9 million specialty and 9 million modifiers! By the way that’s just active at any given time. Pricing options? Other than flat pricing of $1.00, $2.00 etc. . . We handle 195,000 unique price tables. Each price table can be setup with 9 different prices per day of the week. That’s 45 different prices that change based on the time and day. Coupons, discounts, total tickets, customer history, reporting – these are all based on the size of your physical hard drive. 99,999 Total employees or one new employee added to the system every day for 273 years! 9,999 Active employees at a time. 5 Cash drawers per workstation. We have been selling POS for over 25 years. We have stores that have been using our products for over 20 years continuously! Updates? SP-1 has gone through over 87 version releases (free when you are on support) and over 500 minor program revisions since 1994. Stability? Over 6 of our employees have worked for us over 10 years. Total combined SP-1 experience through Customer Service & Tech Support is over 80 years! I get it, you don’t have a lot of time. So, here is the cliff notes version. . . It will make you money. Really, it’s that simple. Using SP-1 can provide an ROI (Return On Investment) of at least 1% and as high as 7%. Average customers see 3% minimum. Stop making mistakes. We both know that your staff prices things wrong. That’s bad. It’s bad for your customer, your consistency and your business. SP-1 will stop it. Theft controls. We don’t like it but people steal. Not all people – but some of them. SP-1 will help you catch them and put a stop to it. Everything is tracked. Voids, free items, discounts, double punching, coupon theft. Reporting. Do you like sitting at home entering numbers into Excel or Quickbooks? Stop doing it. Put SP-1 in and let us take care of that for you. Get back to what you love. Gift & Loyalty. If you are paying a swipe charge or monthly fee for this, then you are most likely getting ripped off. It’s FREE. Stop doing handwritten gift certificates that are a pain, stop using punch cards that are cheated on. Stop hoping your staff uses the right discount. Make it professional and fool proof. There you go. . . 5 quick Cliff Note style reasons. Now, call us and let us give you the full novel version! I’m often asked by our owners if they can charge an inactivity fee if a gift card is not used. It’s a tricky question to ask because it really depends on the state laws. Usually a store owner wants to look at eating up the residual balance from the gift card after a specific period of inactivity. There is a great resource available here that shows various laws by state. Please do NOT consider any of this as the word of law without checking directly with your state! Today we have a guest blog from one of our partners. Gary Lentz at Vend Lease has worked with us to secure financing to purchase SP-1 for many of our customers. I asked Gary if he had some words to help clarify leasing. . .
First, let’s rid ourselves of the notion that leasing is a “dirty” word. Many of us are of the mind set that if we lease something that we made a bad decision, or that we were somehow mislead in the transaction and wound up making a bad deal. Let’s set the record straight…Today, leasing is the preferred method by over 80% of U.S. corporations that purchase capital equipment. If you own a business that requires equipment, or technology, to produce revenue, or save time and labor, then leasing may represent the most cost-effective course of action. Leasing provides benefits that solve business problems and satisfy company needs. Often, leasing is the more efficient way to grow your business with less risk to capital. A lease is normally structured in one of two ways – as a capital lease or as an operating lease. However, each is used for different purposes and treated differently from a business accounting perspective. What’s most important is that leasing, in general, affords businesses the opportunity to invest in the latest technology and stay ahead of the competition. 1. Lease payments may be 100% tax deductible (consult your tax advisor). 2. Leasing preserves other established lines of credit. 3. Fixed lease payments facilitate monthly budgeting of your expansion project. 4. Leasing improves cash flow, allowing you to pay for equipment as it generates income. 5. Keeps cash in your hands while you update to more technologically advanced equipment. Growing and expanding any business requires equipment and technology. Leasing will clear the hurdles that typically confront the purchase of capital equipment, i.e., sticker shock, lofty down payments and shrinking lines of credit. Leasing is frequently less expensive and is one of the building blocks to building business success. Do you review the security levels in SP-1 from time to time? If not, you should. It’s vital to check over what access employees and managers have. Remember that your store evolves over time. Call us to make sure what your employees are currently allowed to do. Are you checking that your password is not being used by anyone else? Check the audit reports we offer and compare them to the times you and your manager work. If you see those employee codes used when you are not there, then you have a problem! Do you change your password on a regular basis? I hope so! In 7.60 and above, you are required (PCI / PA-DSS Standards) to change your password every 90 days. If you are not doing that now, you should be. It’s one of the best ways to insure you employees don’t have access to your system. Are you using “hard” passwords? Is your password “1234” or your name? That’s not OK and we all know it. Your passwords should be at least seven characters with a combination of letters and numbers. Do you allow Windows access? This is a tough one. In some cases you may have to. If you don’t have a specific need to, then make sure you set SP-1 up to be maximized at all times. This helps eliminate the ability to access Windows. 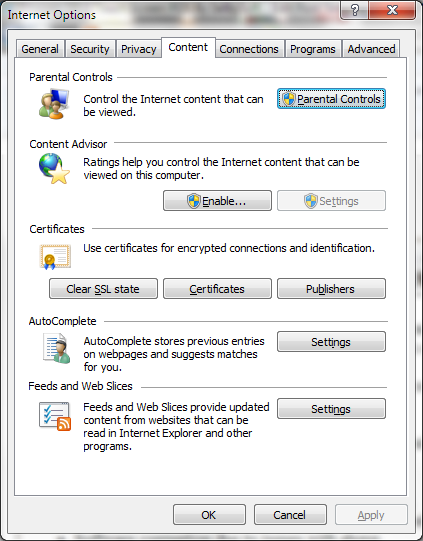 If you do allow employee access, then check the Internet Explorer history on a regular basis to see what your employees are doing online. What about checking your Audit Reports with Customer Service? Call us on this. Seriously – you need to ask about this. Basically, we can show you any ticket that has been altered or reduced and help you stay on top of theft. Do your employees have a separate code to clock in? What about employee cards or fingerprint ID? Please don’t use one employee code or card for everyone in your store! If you have to use codes then make sure each employee has their own. This will allow you to track who is doing what and when! Hopefully, you answered all of these correctly! If you didn’t then you might want to call us to review how we can make sure you are as safe from theft as possible. Where are your POS stations located? I suppose a better question would be where SHOULD your POS stations be located? This blog came about as a comment from one of our Customer Service technicians. They each talk to hundreds of different stores a year and have a different perspective on what goes on in a store. They brought this up in our last meeting because they run into a lot of people that give no through as to placement. I’m not talking ergonomics here – I’m talking safety and longevity! Right next to the hand washing sink. Right next to the dish washing sink. Ovens – Please don’t back the computer right up against your super hot conveyor oven! Under the counter, behind the stack of paper napkins with zero airflow. On the floor that is mopped once a day. Anyplace where the computer looks like it is balancing on edge. These may seem a bit silly but we run into them! The thing you want to look for is some kind of airflow around the machine – It does not need to be on a shelf by itself but don’t cram it in there either! So call us before you put the POS in place and we will help you understand what will make your life easier! Problems with staff and the internet? You are not the only one! We have many customers that would like to lock out internet usage on their POS terminals. There are a number of reasons to want to lock out employess on the POS. No matter what else you may want to do with your POS computers, remember that you purchased them to operate first and foremost as point of sale stations. PCI and Credit Card security can be comprimised. Potential for virus, spyware or malware is increased. Software corruption due to issues with above. Potenial illegal downloads of movies, music etc. Ok, so we have some reasons why we don’t want employees to have unfettered access to the internet. How do we accomplish this? Well, it’s not completly something to be covered in a short blog but there are some suggestions that we can help you with. Start by looking at your Internet Explorer options. 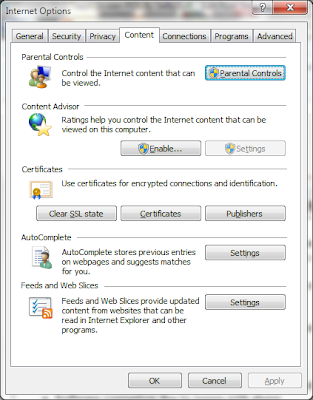 Under the Tools, Internet Options, and then Content tab, you can set many different ways to control content access. Another great way to stop unauthorized access is to secure your station with different user access through Windows. When we setup our SP-1 Touch Screen systems, we utilize the different user accounts under Windows to lock down the Internet Explorer access. So there you have it – a couple ways to help make sure you have things locked down and secured! New 40 Column Balance Till Report. Version 7.50g and above have a new balance till report available. This is our till report intended for the 40 column receipt printers.